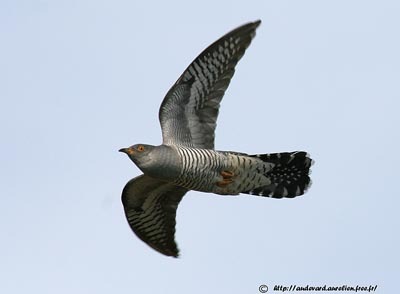 Common Cuckoo is well known for its typical call which announces the spring! Adult male has grey plumage. Upperparts are ashy-grey, including the wings. The tail is dark brownish with white spots and tips, and black bars. Underparts are white, heavily barred dark grey to black. Chin and upper breast are pale ashy-grey. Undertail feathers are black with white spots and edges. Head is grey. The bill is yellow at base and black-tipped. Eyes are yellowish-brown to orange, surrounded by yellow eye-ring. Legs and feet are orange-yellow. 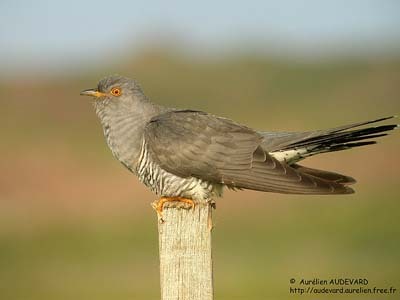 Common Cuckoo is widespread in its range, depending on the presence of its preferred host species. This species is not threatened at this moment. Female is almost similar, except the upper breast which is rather rufous than grey. In the race “canurus” we can find a rufous morph in females, with chestnut tinge instead grey. Juvenile has pale brown upperparts, heavily barred black, with white-tipped feathers. Tail is strongly barred black. Underparts are white, finely barred dark grey. Eyes are dark brown with yellow eye-ring. C.c. bangsi; C.c. canurus; C.c. subtelephonus; C.c. bakeri. They slightly differ in colour intensity and barring, and share the wide distribution of this species. The male song is very typical “cuck-oo”, with higher first note. This song is far-carrying. We can hear some variants such as “kuk-kuk-kuk-oo”, and occasionally a single “kuk”. When excited, it also utters a short “gowk gowk gowk”. Female gives a rapid bubbling sound “kwik-kwik-kwik”. Common Cuckoo is usually quiet during the most part of the year, but it calls almost continuously during the breeding season, for territorial behaviour and displays. 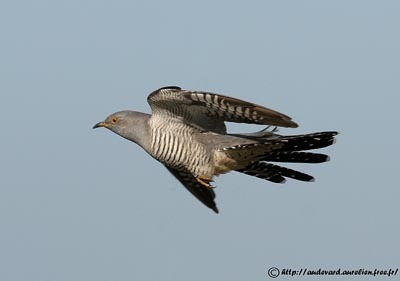 Common Cuckoo frequents coniferous and deciduous forests and woodlands, open wooded areas, forest edges and clearings, steppes with trees, meadows, marshes and reedbeds, cultivated areas with trees and bushes. It may be found up to 2000 metres of elevation, and much more according to the range. 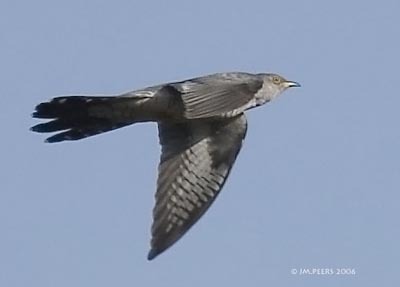 Common Cuckoo is summer visitor in Europe and Asia. It breeds in Europe, Asia to Nepal southwards China and Japan. It winters in Africa, crossing the Mediterranean Sea and the Sahara to reach the equatorial regions, and even South Africa. Common Cuckoo feeds primarily on insects and caterpillars. These hairy caterpillars are rejected by the other birds’ species. But in order to avoid to be poisoned, the cuckoo bites one end of the insect and slices it open with the bill, and then, it shakes it to extract the toxic matter before to swallow it. The hairs of the caterpillar are regurgitated later in pellets. Common Cuckoo feeds in woodlands where it also catches large insects (cicadas - locusts) and numerous kinds of preys, including spiders. It also takes eggs and chicks in the nests where the female lays her own eggs. Common Cuckoo is a shy bird, often seen alone outside breeding season. At this time, they become noisier, both male and female uttering their calls. Common Cuckoo perches in exposed tree or pole, with cooked and spread tail, and drooped wings. 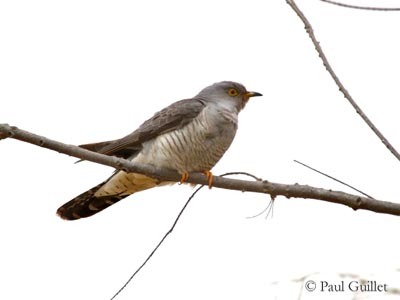 Common Cuckoo is a brood parasite, which means female lays her eggs in other birds’ nests. Some explanations about this particular behaviour try to give the reasons. Common Cuckoos adults feed on poisonous insects. This food is not adapted to chicks and young birds. So, parents choose other host species, able to provide good food to their young. 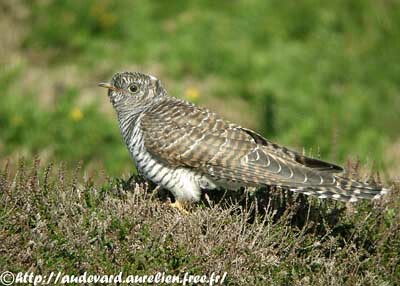 The young cuckoo ejects eggs and chicks from the nest, in order to receive more food. These potential hosts often mob the Common Cuckoo near their nests, but the female cuckoo observes the behaviour of the chosen host and when the bird leaves its nest, she lays one egg before the beginning of the incubation. She usually removes one egg and replaces it by her own egg. Her eggs may have several colours and patterns in order to melt into the clutch. During only one season, she may lays between 10 and 25 eggs in several nests. In this species, both sexes begin the courtship displays. Female gives her bubbling call and the male approaches or the contrary. The male bobs the head and bows the body. Wings are held open and dropped, and the tail is fanned and raised. Then, the male rotates its body and moves from side to side. Female takes a look during these displays. Courtship feeding may occur sometimes. Before mating, the male sometimes offers a piece of vegetation to the female. 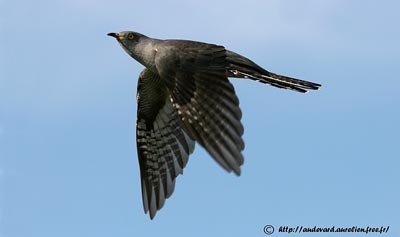 Common Cuckoo has rapid direct flight. Its wing beats are very active. Its flight is similar to those of raptors but weaker, with shallow wing beats and rapid flapping, without any glide. 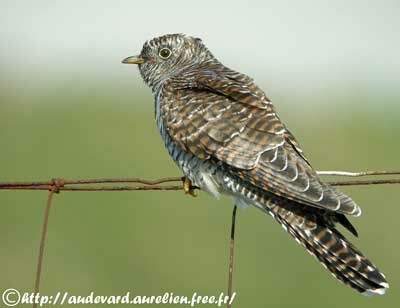 Common Cuckoo is a brood parasite and does not build any nest. After laying, the egg is incubated by the hosts and after 12-13 days, the young cuckoo hatches. As it receives all the food, it grows rapidly, becoming larger than its foster parents. It leaves the nest about 2-3 weeks after hatching and will migrate southwards, later than its true parents. Some hosts are able to remove the cuckoo’s eggs if the mimicry is not perfect. About 100 species may be parasitized by the Common Cuckoo. Common Cuckoo feeds on varied insects and hairy caterpillars, and also eggs and nestlings of songbirds.